Saturday June 12th 1897 I was busy about the work the whole time time three oclock. Will and I went up to Stevens for a little while. The boys took down the kitchen stove pipe in the forenoon. It was nearly bed time when I got my evening work done. Sunday June 13th 1897 I was busy till ten oclock fixing things to leave for the boys dinner. Will and I then got ready to go up to Nelsons for dinner. The folks were down from home. the day was intensely hot. We had a good visit though. I was over to see Emma Weldie about something before supper. Monday June 14th 1897 Will and I took a early start to town the heat was intense. We got an gasoline stove and did some other trading. We heard that Esther Chalfant had been stricken down with paralysis on yesterday about noon. I was up at the house a few moments. I was till late in the afternoon getting my work down and went over to Aunties a moment. Charles Stinson is there. Did evening work. 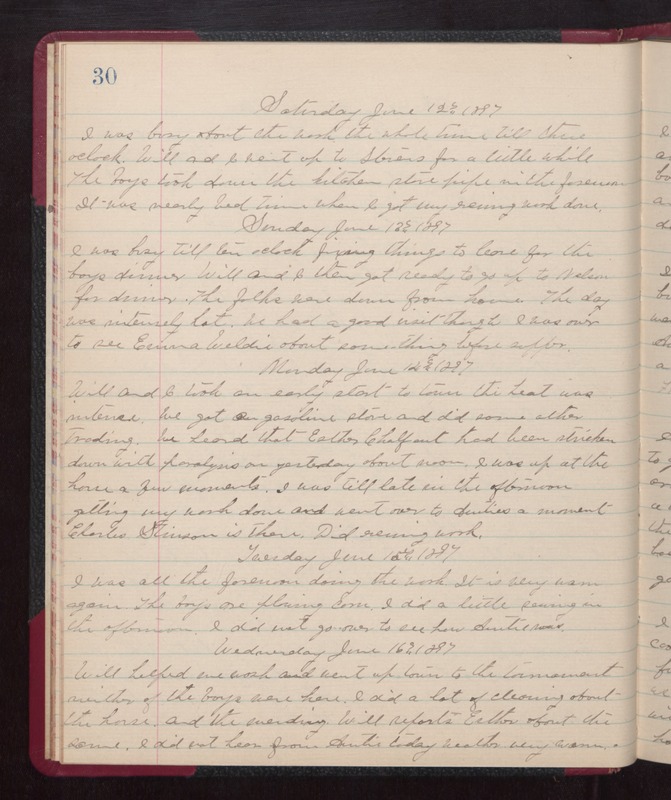 Tuesday June 15th 1897 I was all the forenoon doing the work. It is very warm again. The boys are plowing corn. I did a little sewing in the afternoon. I did not go over to see how Auntie was. Wednesday June 16th 1897 Will helped me wash and went up town to the tournament. Neither of the boys were here. I did a lot of cleaning about the house and the mending. Will reports Esther about the same. I did not hear from Aunti today. weather very warm.